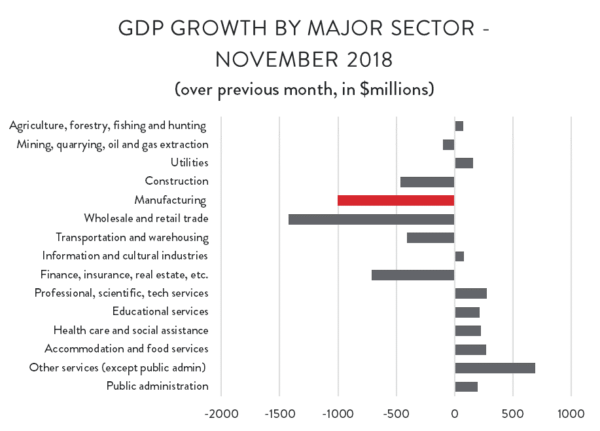 After a strong showing the previous month, the Canadian economy retreated slightly in November, as weakness in energy, trade and manufacturing all weighed on growth. All told, the Canadian economy contracted by an estimated 0.1 per cent in November – equivalent to an annualized decline of about 1.2 per cent. The decline was not unexpected given plunging energy prices that month, but the fact that the drop in economic activity was far from limited to the energy sector is cause for some concern. 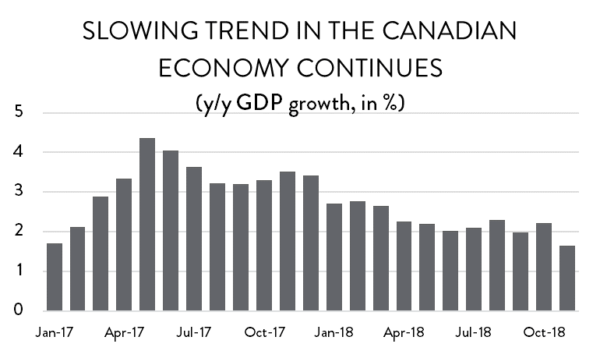 With only one more month of data (and a few more revisions) to go, the Canadian economy is still tracking slightly ahead of expectations for 2018 as a whole. CME expected growth in the range of 2.0 per cent for the year, but the economy is currently on track to deliver a 2.3 per cent increase. 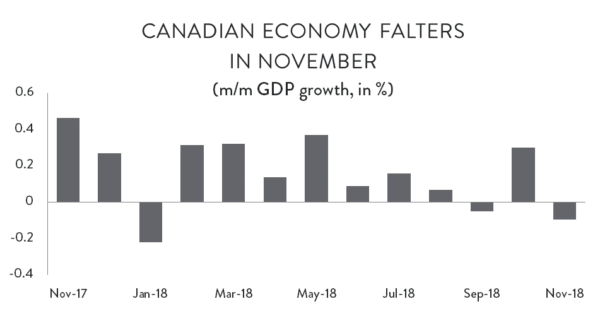 However, December is likely to be another weak month for the Canadian economy, meaning that annual GDP growth should come in closer to expectations. At the industry level, value-added output was actually higher in nine of the 15 major industrial groupings, but those increases were relatively modest, while the declines in the remaining six were more severe. On the negative side, the biggest decline was in wholesale and retail trade activity, where GDP fell by an annualized rate of 8.1 per cent ($1.4 billion). Manufacturing activity was also down sharply, declining by 5.6 per cent ($1.0 billion), while there was also notable weakness in finance and insurance, as well as construction, and transportation and warehousing. On the positive side, there were modest gains in renewable resources and utilities, as well as in health care, education and a range of other services. 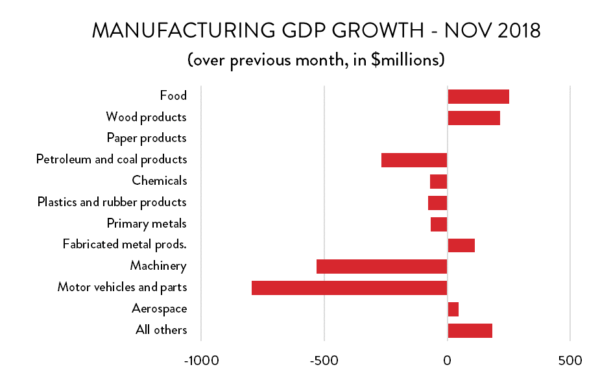 Looking more closely at manufacturing, the 5.6 per cent decline in November was quite severe, but the silver lining is that GDP growth estimates for September and October were both revised upwards considerably, meaning that, even with November’s drop, overall activity in the sector is stronger than initially thought. Early estimates suggested that GDP in manufacturing fell by 8.2 per cent on an annualized basis in September. That was revised to a 3.8 per cent decline. Meanwhile, October’s healthy 8.2 per cent increase was revised even higher – to 10.0 per cent (annualized). Even so, the evidence clearly suggests that manufacturing activity in Canada is slowing. On the whole manufacturing GDP is only slightly ahead of where it was in April, and remains below its July peak. While the decline in the overall economy was driven by a handful of industrial groupings, losses in the manufacturing sector were more widespread. Of the 11 major manufacturing sub-sectors, six were lower, one (paper products) was effectively unchanged and just four were higher. That said, some of the declines were significant. On a dollar-value basis, by far the largest decrease was in motor vehicles and parts industries where value-added output dropped by $794 million compared to October – a month-over-month decline of 4.8 per cent which translates into a 44.4 per cent drop on an annualized basis. 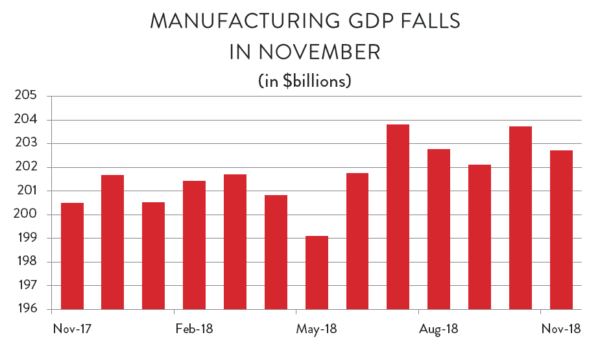 GDP in machinery production was also down considerably, falling by $531 million, or 2.9 per cent compared to October (an annualized 30 per cent drop). Meanwhile, to no one’s surprise, GDP in refined petroleum was also down as plunging oil prices in November dampened production values. GDP in petroleum and coal refining fell by $268 million – a 2.2 per cent decline month-over-month, which translates into 23.2 per cent on an annualized basis. On the positive side, there were strong gains in food processing ($252 million) and wood products industries ($215 million). On top of that, some of Canada’s smaller manufacturing sub-sectors posted notable increases; computer and electronics industries saw GDP rise by $480 million to reach a new all-time monthly high, while furniture and related industries bounced back from October’s decline.